With the help of this tutorial, I was able to get IE8 running on my Macbook, which will make troubleshooting cross-browser compatibility issues much easier in the future. I’m about to embark on what will probably be a two-week initiative to convert Preceden’s timelines over to the HTML5 canvas. Currently everything except the charts are created by manipulating a lot of DIV elements, but there’s only so much you can do that way. Canvas should provide a lot of flexibility in terms of visualization. Hovering over the large green rectangle, for example, shows me that the 15 GB IE8 VDI image I downloaded today is taking up a lot of space. Colors are used to mark similar file types so the maroon blocks, for example, are MP3s. Preceden uses a similar combination of size, color, and mouse-over details to visualize time. It’s amazing how much you can do with just those three things. You can download Disk Inventory X for free from its website here. 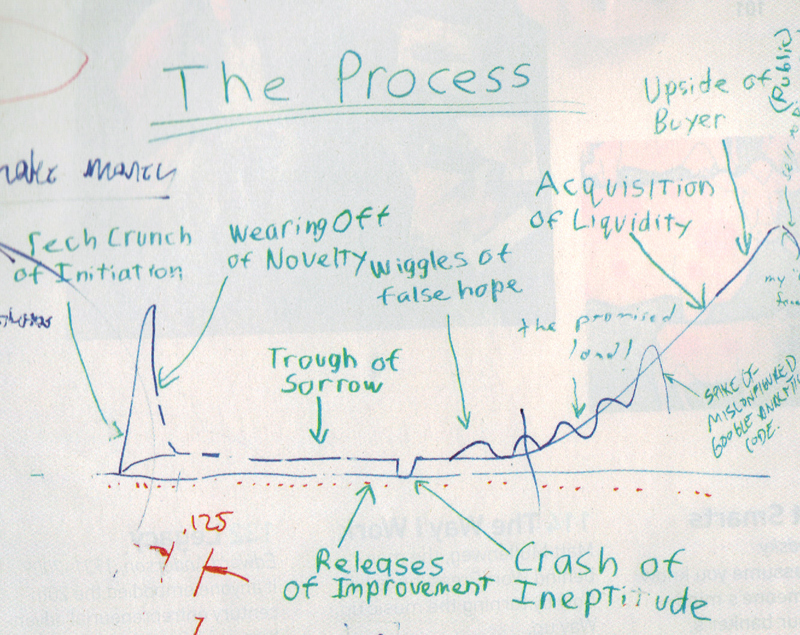 There’s a famous graph that used to be on one of the dry erase boards in the Y Combinator office in Palo Alto, depicting the life of a startup. Preceden is somewhere in the Trough of Sorrow at the moment, though its not as bad as the name suggests. After receiving sporadic spikes of traffic over the first few weeks, the number of visitors has stabilized at about 400 per day. The challenge now is to keep pressing forward, to continue iterating, and to build something truly amazing. On that note, I’m happy to announce that Shaun, a Salt Lake City-based software developer, has joined the effort. He contacted me after reading about Preceden on HackerNews and after a bit of back and forth, we decided to give it a shot. I’m really excited to work with him–he’s smart, hard-working, digs timelines, and we get along really well. Update: The partnership between Shaun and I never went anywhere.